I’m on vacation! It’s the time of year (summer) that is filled with fun and family. I am currently in Green Harbor, MA hanging out with my family. We’ve been coming here for more than a decade! And my dad has been coming to Green Harbor since the early 70’s! It’s safe to say that we love the little town of Green Harbor, Massachusetts. Lacrosse will be taking me down to Maryland and Pennsylvania in mid-July, so that’s currently on my radar. In the meantime, I’ve been cooking up a storm! 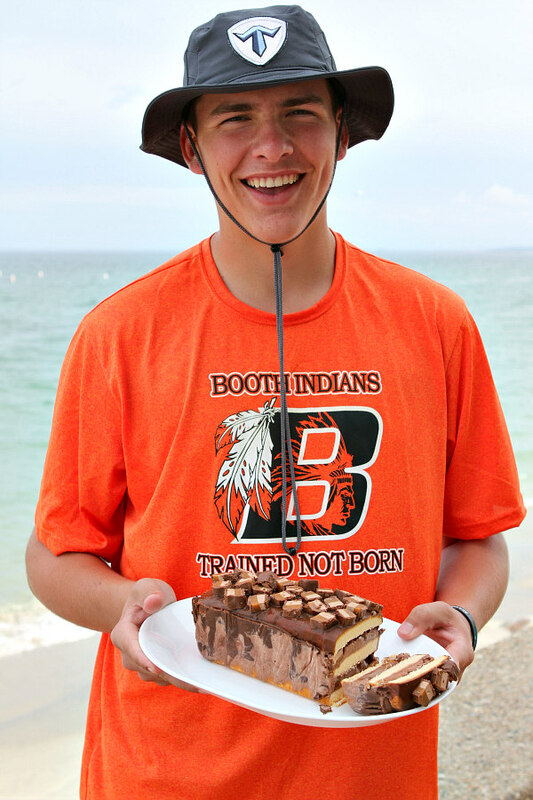 This week I chose to share an Easy Candy Bar Ice Cream Cake! 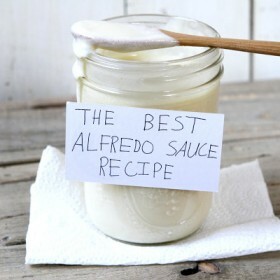 I have to say… This recipe looks SOOOO GOOD!!! All of the different layers create a black & white striped look. This recipe is adapted from a recipe created by Ree (a.k.a. The Pioneer Woman). Her original recipe was a bit different from mine, but still amazing! One layer is pound cake. 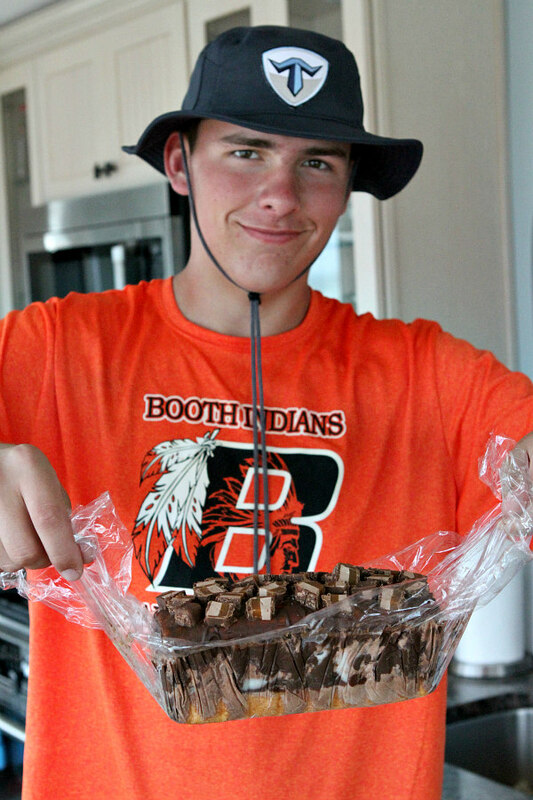 Another is chocolate fudge brownie ice cream, and then chopped Milky Way candy bars. Magic Shell and chopped Milky Ways are on top. Sounds pretty darn good to me! 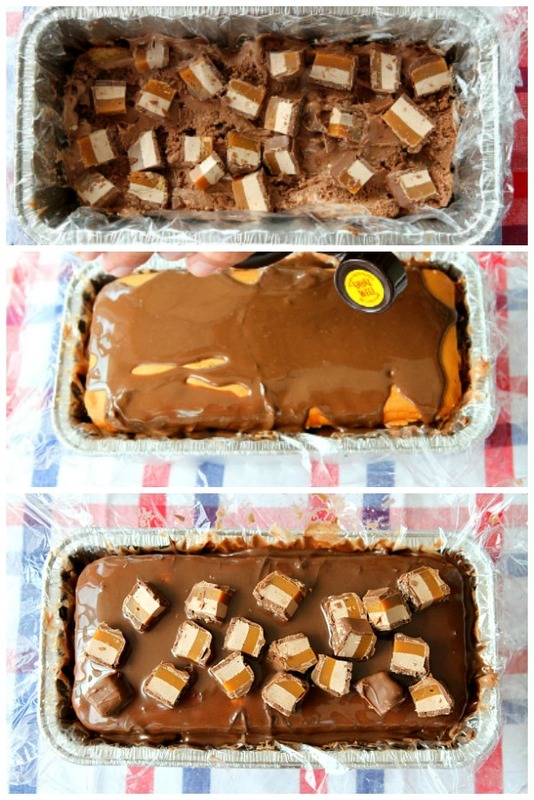 Such an easy process… Assemble the layers in a plastic wrap-lined loaf pan and freeze it. Pull it out by the plastic wrap. That’s it! I might have gone a little overboard on the Magic Shell… But that’s okay! It created this cool-looking chocolate drip on the side of the cake. Whoa. That’s the only word that comes close to describing this picture…. This ice cream cake was fantastic! If you don’t like Milky Ways, you can’t be from this planet. But if you like another candy more than Milky Way (which is impossible), you can always swap it out for the Milky Ways in this recipe. You can also sub the chocolate fudge ice cream for a different kind of ice cream. Whatever you like the most! 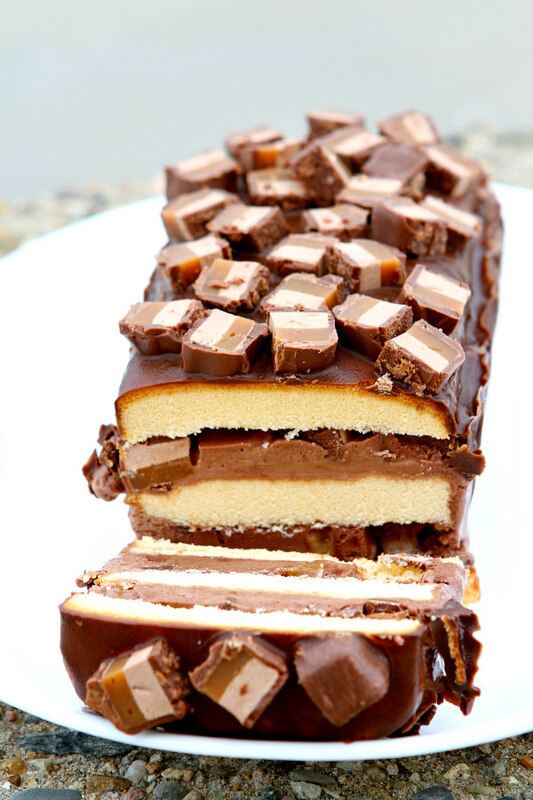 Definitely make the Easy Candy Bar Ice Cream Cake this summer… It is super easy to make. Assembly shouldn’t take more than 15 minutes. 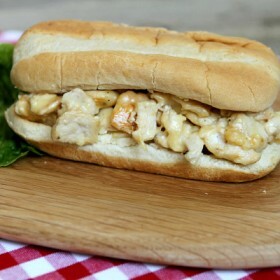 This is one of those recipes that you can customize to YOUR preferences, which is awesome! 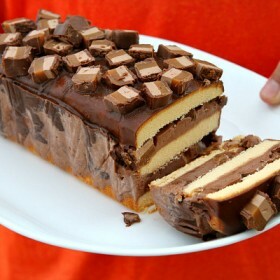 So use your favorite ice cream and candy to create an awesome ice cream cake… It won’t let you down! Line your loaf pan with plastic wrap- letting the plastic hang generously over the sides. Slice the pound cake into thirds (the long way). Place one slice of the pound cake on the bottom of the pan. Cover it with a couple of scoops of ice cream and smooth to make even. 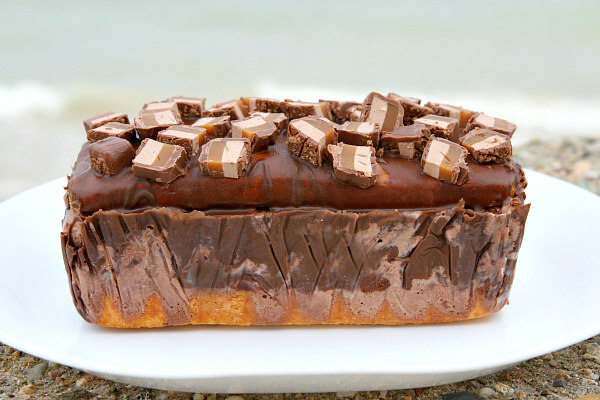 Sprinkle candy bar on top. 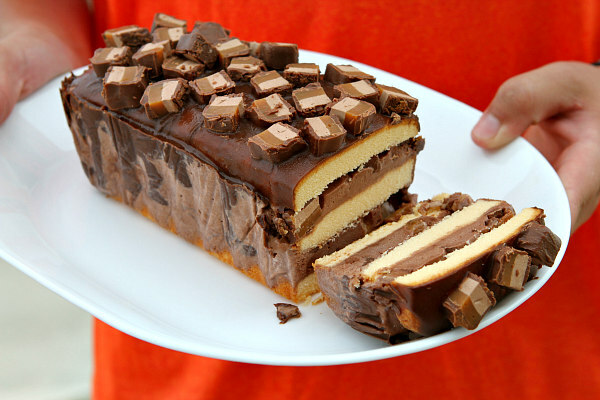 Add another layer of pound cake, more ice cream and more candy bar chunks. Place the 3rd layer of pound cake on top. Shake the Magic Shell thoroughly, and squirt it all over the top of the cake. Sprinkle candy bars on top. FREEZE. Slice and eat when all is frozen and ready to go! We liked topping our slices with caramel syrup. My grandkids and I love this cake. Every time they come over, we make it together. We love to switch it up. But they agree yours is the best! Thanks for sharing.